Table tennis rules, or as formally known as ‘The laws of table tennis‘, are created by the International Table Tennis Federation (ITTF), and reviewed annually. The rules used to be clearly laid out on the ITTF website, but since they updated the site completely, it’s now hard to find, and needs to be extracted from the ITTF Handbook, which is a pain as it’s a large PDF document. For this reason, I’ve created these pages, which breaks the rules up into easy to read sections, making it a handy reference. 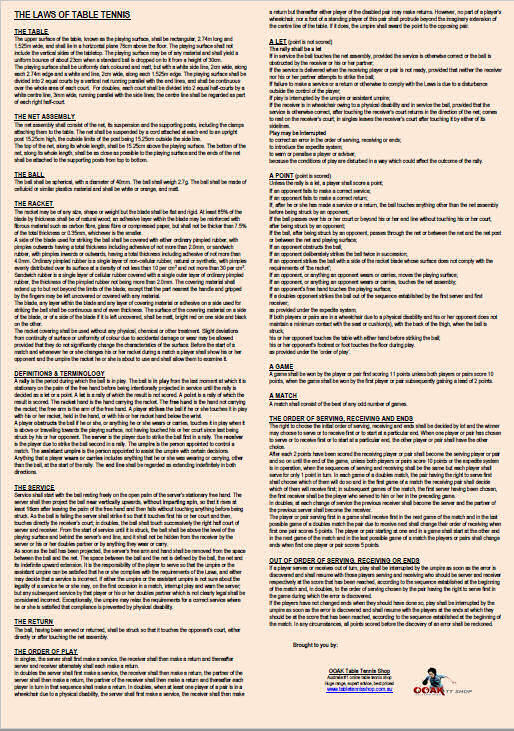 I’ll update this section regularly, so that it’s always got the latest rules (although very little changes over time). There are further rules & regulations for International play, but these are in addition to the rules below, and don’t usually apply to mere mortals like us, as we don’t play under international conditions. Slight amendments or changes to the official rules are proposed every year by the ITTF and/or their member associations. A majority vote at the ITTF AGM decides if the new proposals are accepted. All member association can vote, and carry an equal weight. This means that a vote from a major table tennis super power like China, carries the same weight as a vote from a minor country like Djibouti. The table tennis rules below are broken up into an Equipment section, which covers all the equipment used in a game, and a Play section, which covers all the rules for actually playing the game. Some sections are combined into a single page as they quite short. Note that it starts at section 2.0, since section one is related to the ITTF constitution. Just click on the relevant link for the section you’re interested in. OOAK Table Tennis Shop also provides an A3 table tennis rules poster, with the rules clearly laid out in plain English. 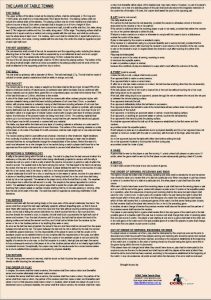 This provides a neat option to print all the rules on a single page, which you can hang at your workplace, home or club as a handy reference. Click on the image (right) to open the PDF for printing. Note that if you’re going to print is, it comes out best on an A3 sheet of paper. Can table tennis serve bounce twice? Yes, it’s a common strategy for a player to serve a short ball that bounces twice on the opponent’s side, before it goes over the edge. The receiver must return the serve before the second bounce, or they will lose the point. Can you lose table tennis on a serve? Yes, the server will lose the point if they fail to put the ball into play. This generally happens if they miss the ball, hit it into the net, or over the end of the table. You will not lose a point if ball touches the net and the serve is otherwise legal, that’s a let and the point is replayed. Can you volley in table tennis? No, you cannot volley the ball in table tennis and win the point. The ball must always bounce on the opponent’s side of the table, before the opponent can strike the ball. Where to serve in table tennis? In singles for a legal serve you can bounce the ball anywhere on your side of the table, then to any area on the opponent’s side. In doubles the ball must bounce on the server’s right half of the table first, then to the receiver’s right half of the table. How to serve in table tennis? To serve legally you must throw the ball up vertically from the palm of the hand at least 16cm without imparting spin. The serve must be done from a position behind the server’s end line and above the table level. How to score in table tennis? Each player gets 2 consecutive serves, a point can be won by either the server or receiver. The first player to reach 11 with a 2 point margin wins the game. If the game reaches 10:10, players serve only 1 serve each, and keep playing until one leads by 2 points to win the game. Matches are usually best of 5 or 7 games. The latest table tennis rules, broken down into to sections to make it easier to find and read. Updated regularly to include the latest changes. Last update Jan 2018.